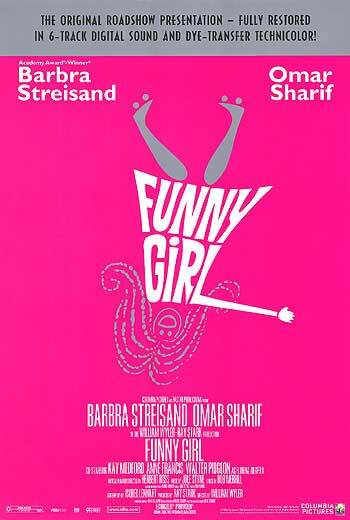 Funny Girl is a highly fictionalized account of the rise to stardom of the great Jewish American clown Fanny Brice. It was a hugely successful film musical in 1968, made from the equally successful Broadway show, and it introduced Barbra Streisand to American moviegoers. It is above all else a premier star vehicle, and it still holds the moment of recognition: a star really was born in that film. It follows Brice from humble beginnings on the Lower East Side of New York, and it offers romanticized glimpses of that legendary home to Jewish immigrants and their children. In the film, Brice is pictured as the only child of a single mother who struggles to make ends meet. Fanny is a talented singer and comic who is not sufficiently pretty to make it as a chorus girl. She parlays mishaps in her one chance on a burlesque stage into a show-stopping song that inspires the boss to hire the hapless chorus girl as a singer. That same night she meets Nicky Arnstein, (Omar Sharif) a professional gambler with whom she falls madly in love. As her career soars, his luck falters. At the end of the film, Fanny is alone but still strong, still singing as only Streisand can. I have tagged Funny Girl as “US History,” but that has to do with the film’s place in history, not with the film as history. It was the Oscar-winning debut of a great American Jewish entertainer, Barbra Streisand. It was made during the same period as the Six Day War, and the kiss between Streisand (a Jew, and vocal supporter of Israel) and Sharif (an Egyptian actor) was very controversial at the time. As biography, the film is nearly pure fiction: do not take it as a bio-pic about Fanny Brice. The film and the play from which it was made were produced by Ray Stark, Brice’s son-in-law. Nick Arnstein was still living, and still his father-in-law. The real Arnstein was a con man who had done time in Sing Sing prison before he and Fanny were married, and who in real life sponged cheerfully from her, eventually dumping her when it suited him to do so. Brice, on the other hand, is made a lot ditzier and less professional in the interest of entertainment. The real-life Brice may have had very poor judgment about men, but she was a consummate professional who would not have quit a show to run off and get married, or given Ziegfeld an ulcer with her antics. For more about the differences between the film and reality, check out John Kenrick’s excellent article on Musicals101.com. Some things about this film haven’t aged well; I tend to agree with Roger Ebert that, “It is impossible to praise Miss Streisand too highly; hard to find much to praise about the rest of the film.” If you want to see why baby-boomers get crazy about Barbra Streisand, see this film. The great movie that could be made about the true story of Fanny Brice is, alas, yet to be made. This entry was posted in United States and tagged American Jewish History, Comedy, Musical. Bookmark the permalink.